It’s the time of year when soup sounds amazing to me ALL the time. The temperature has been in the low 30s in Seattle, and although I know there are places that are much colder, it’s just down right frigid for this PNW girl. So soup it is. I think I mentioned this already on the blog, but during my pregnancy with Mira my body started craving meat. It was a shock to my system to crave meat after 13 years of not eating any; however, I felt I needed to listen to my body. It was a real Pheobe moment. Oddly enough during this pregnancy I haven’t craved meat as much, as a matter of fact at times it repulses me. I think the ups and downs of this are really playing with Dave’s emotions; however, he is super supportive no matter what. We’ve been playing with a variety of vegetarian recipes, but like I said, lately I’ve been craving soup. 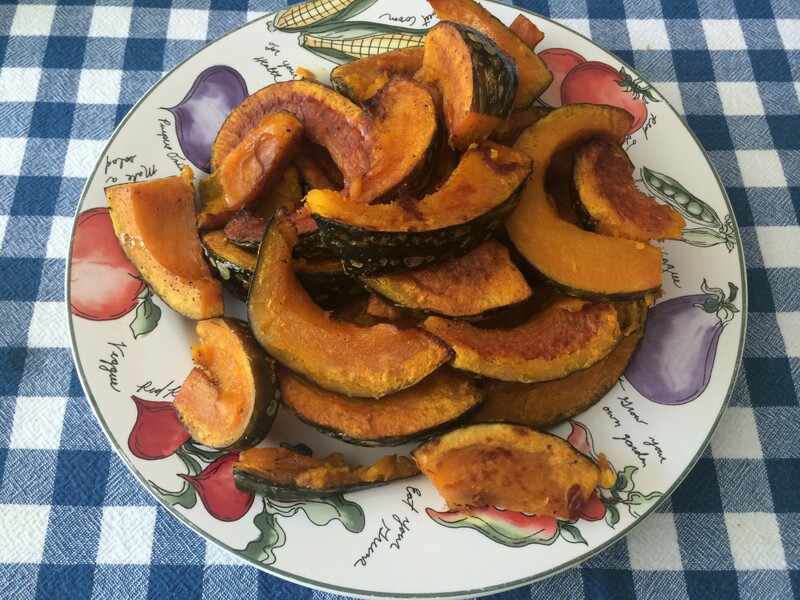 For this recipe I took inspiration from Jillian Michaels’ app and made a few modifications. It is extremely tasty – Mira gives it two arms up (she’s not quite doing the thumbs yet, and most food ends up on her head). I also think it would make a great freezer meal, which is a great thing to learn about during pregnancy. This soup was a big hit with the whole family (Mira has had two big bowls – yay for toddlers eating vegetables). The recipe is vegan, gluten free, and high in protein, which is awesome because it helps this pregnant lady feel full. I’ve been craving the heat throughout this pregnancy, and what I love to add to this dish is my nonna’s peppers. I haven’t tried my hand at making these peppers yet, so I will cherish this jar until it is no more. Dave and I are pretty excited to give it a shot and I’ll let you know how it goes. A little bit goes a long way when it comes to nonna’s hot peppers, so watch yourself. Vegan, Gluten-Free, White Bean & Kale Soup. Heat olive oil in a large pot, combine garlic, celery, onion, and carrot. Cook for about 10-15 minutes or until the aromatics have become translucent. At this point add the white wine and cook until mostly evaporated. Add water, beans, kale, spinach, and spices. Once this comes to a boil add the vegetable bouillon and stir until completely dissolved. Once this occurs reduce heat to low and allow to cook for 40-45 minutes. To finish the soup add apple cider vinegar and lemon juice. * Allow to simmer until ready to eat. *if you prefer a smooth soup at this point you can slowly blend portions of the soup by 1.5-2 cups at a time. I highly recommend that you make this soup to get you through the cold winter months! It’s time for a little link love!! If you’ve been here before then you know what to do, if not, click the picture to get the full story! Vegetarian foods that aren’t in fact vegetarian. I’m definitely not the most stringent pescatarian, but I do like to educate myself on hidden animal products in foods, so I thought this article was interesting. I’ve registered for a free online course through UC Berkley called “The Science of Happiness.” I’m a big psychology nut, so I’m super excited for the course. Enroll with me!!! Okay, so I may have picked a TON of raspberries. But now we have jam for months and these delicious muffins, so all in all it was definitely worth the work. I found the recipe at sweet cannela. When it comes to following recipes I try not to reinvent the wheel, but I’ll admit that I made a few minor adjustments to this recipe (one of which included adding chocolate – um, can you blame me?). 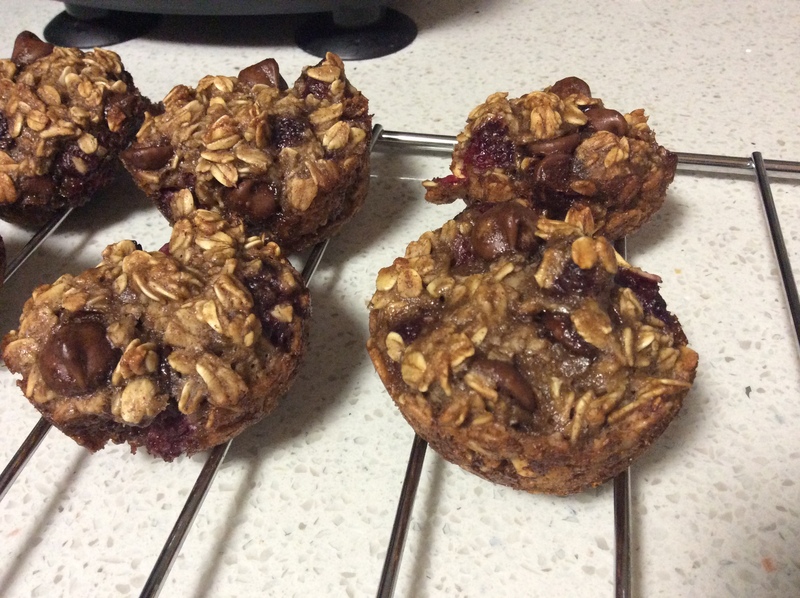 Heat the oven to 350 degrees F (180 degrees C) and grease yo’ muffin tin – I used coconut oil and we had a really good time! My batch made 12 pretty robust muffins 🙂 FYI these muffins took like 5 seconds to prep and 25 min to bake, SUPER quick! 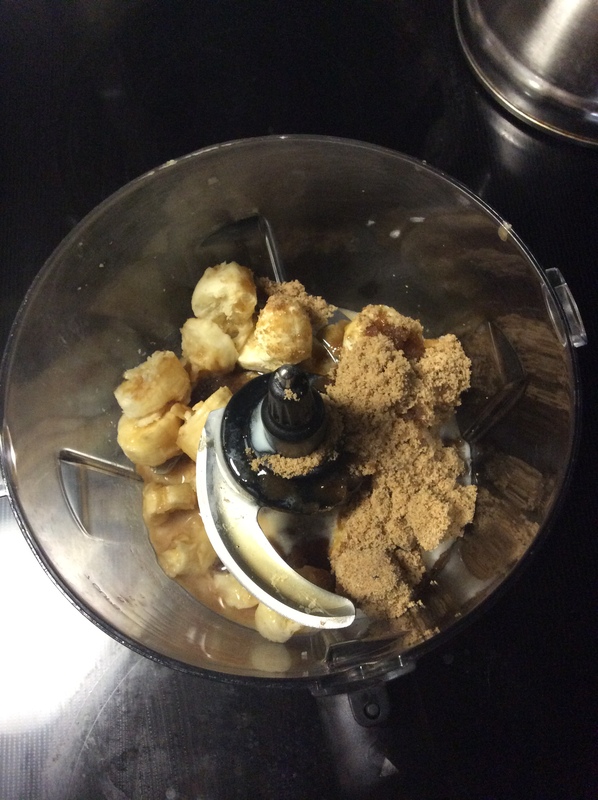 Mix 2 bananas, .5 c almond milk (I used hemp), .5 c brown sugar, 1 tsp vanilla extract, 1.5 tsp maple syrup in a food processor (or ninja — hiyah). Blend the ingredients until they become a smooth liquid. 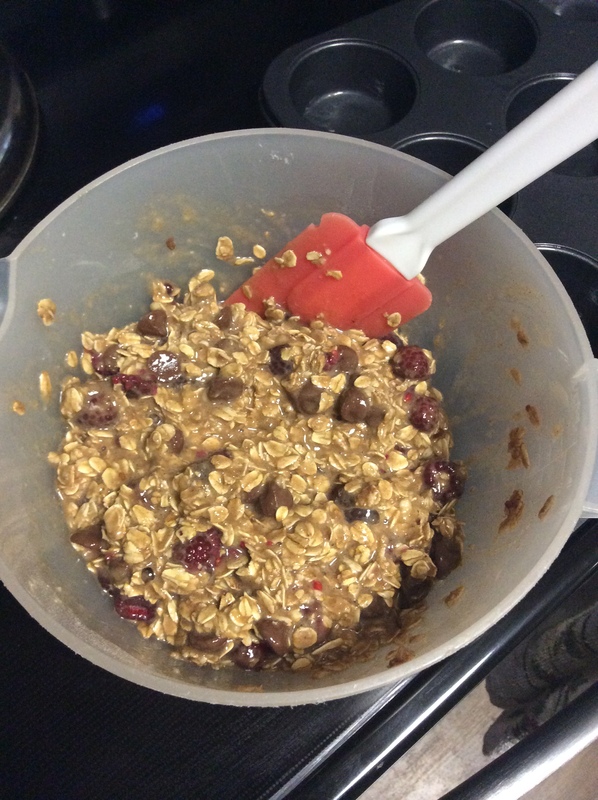 In a separate bowl combine 2 c of rolled oats, 1 tsp of cinnamon, 1.5 tsp of baking powder. Add the liquid mixture and mix it with a spatula. Gently fold in 1 c of raspberries, and if you’d like chocolate chips (I just poured until it looked pretty). 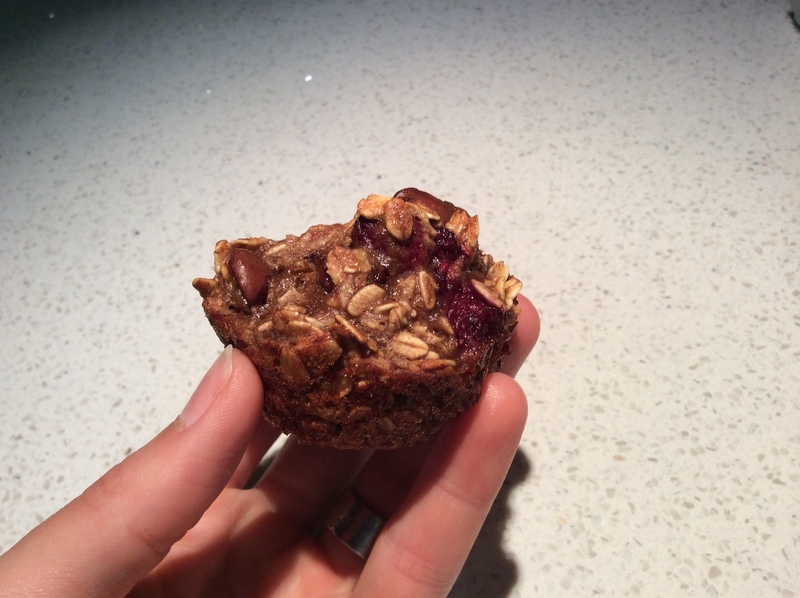 Fill up your muffin cups and bake for 25-30 minutes. 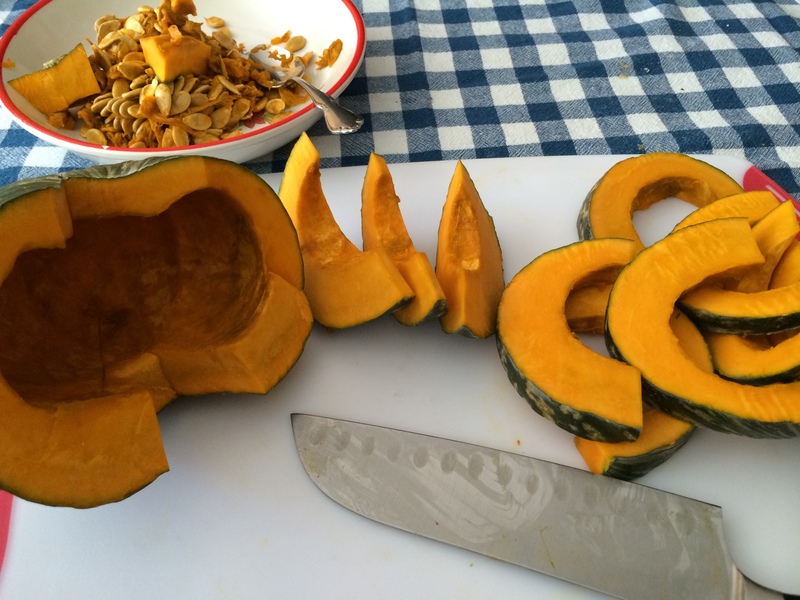 Thanks to spoons I recently became addicted to kabocha squash! 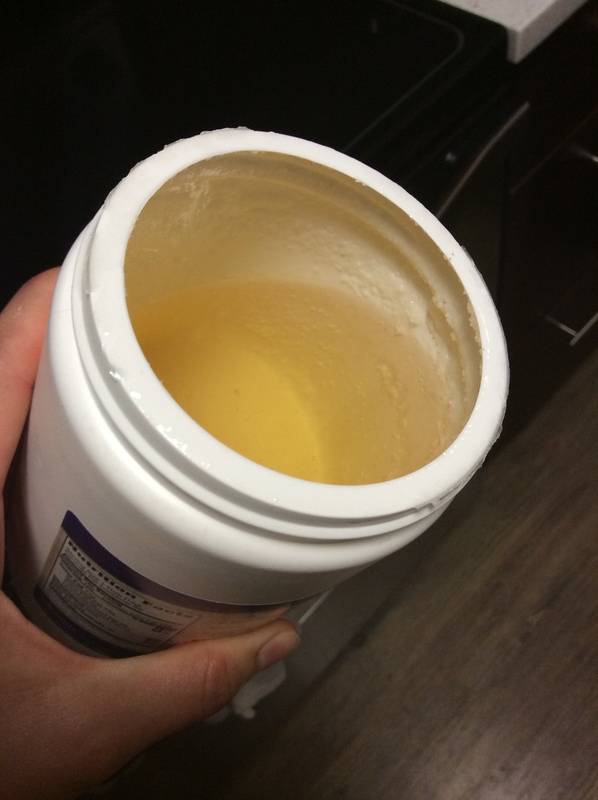 It is so buttery and delicious and I love how healthy it is! Also, it’s really simple to prepare! Preheat the oven to 400 degrees. 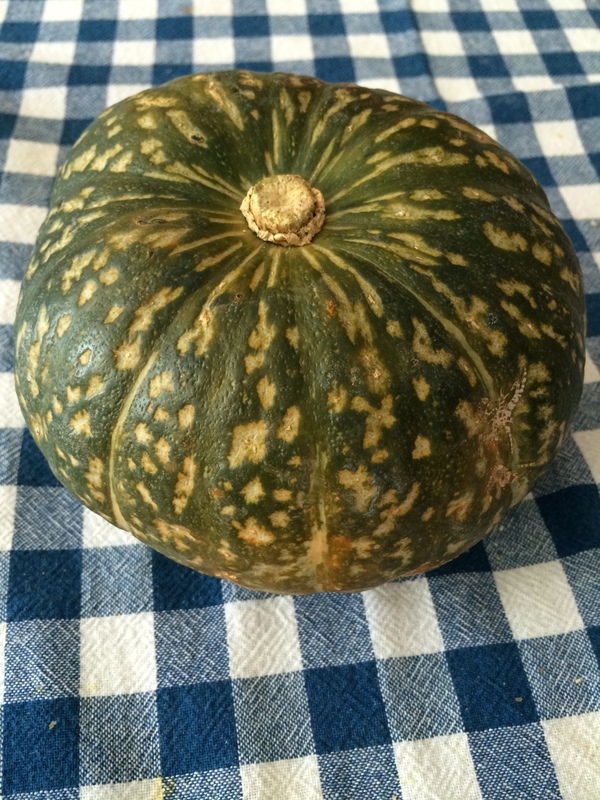 This is what it looks like whole, cute little mini green pumpkin looking fella. 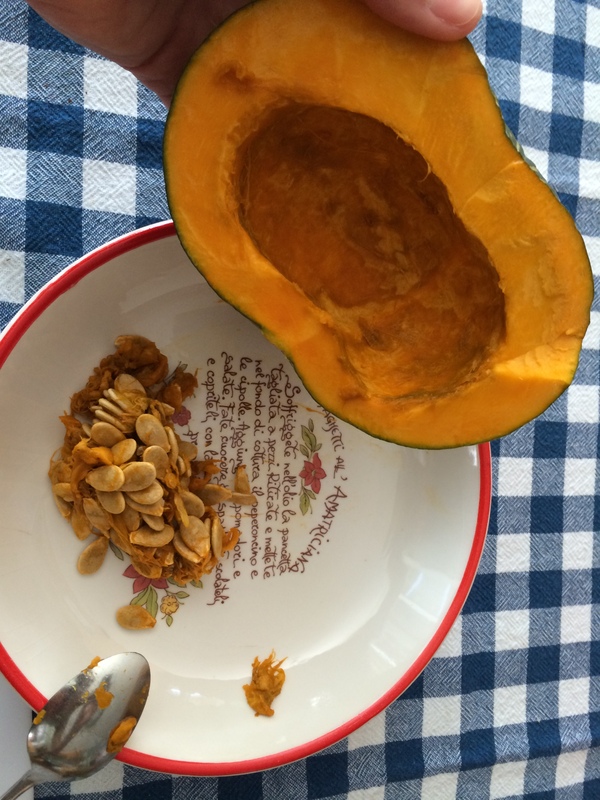 Cut it in half and clean out the seeds. 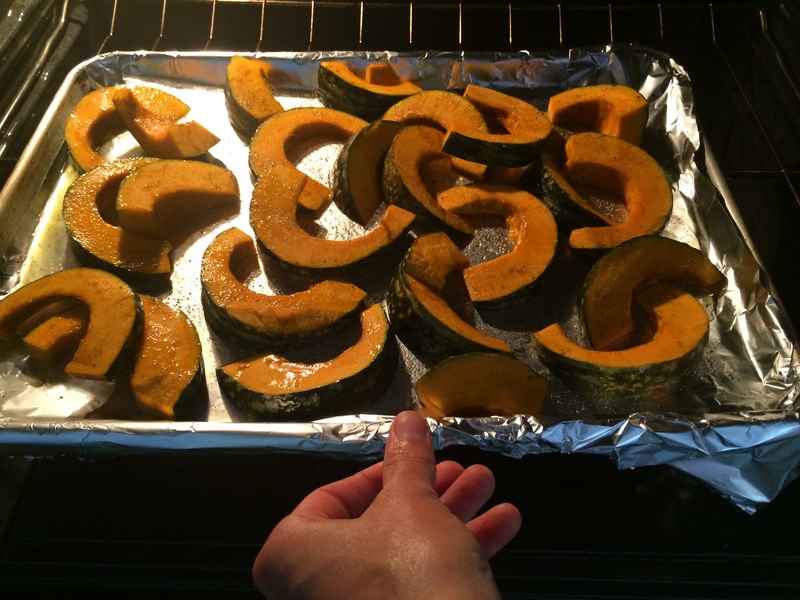 Place on a cooking tray in a single layer. 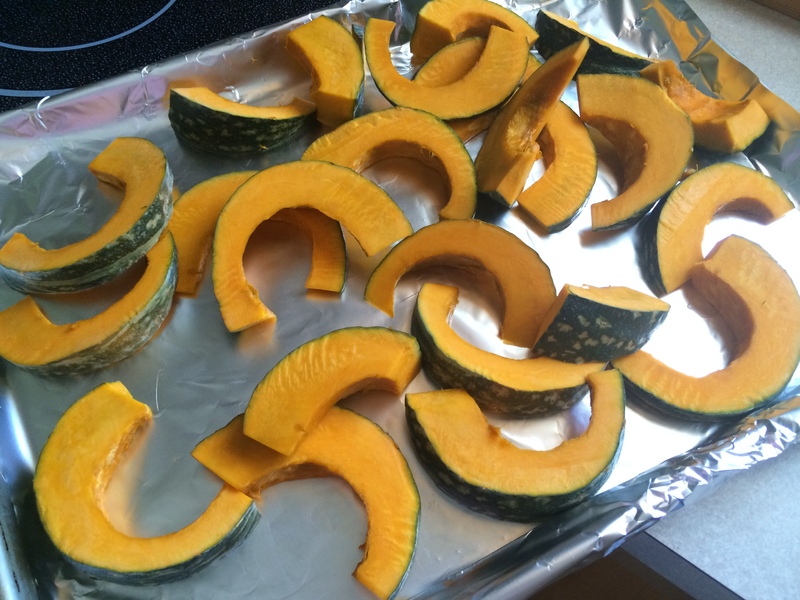 I like to coat the squash in olive oil (or coconut oil when handy) and preferred spices (garlic, salt, pepper). 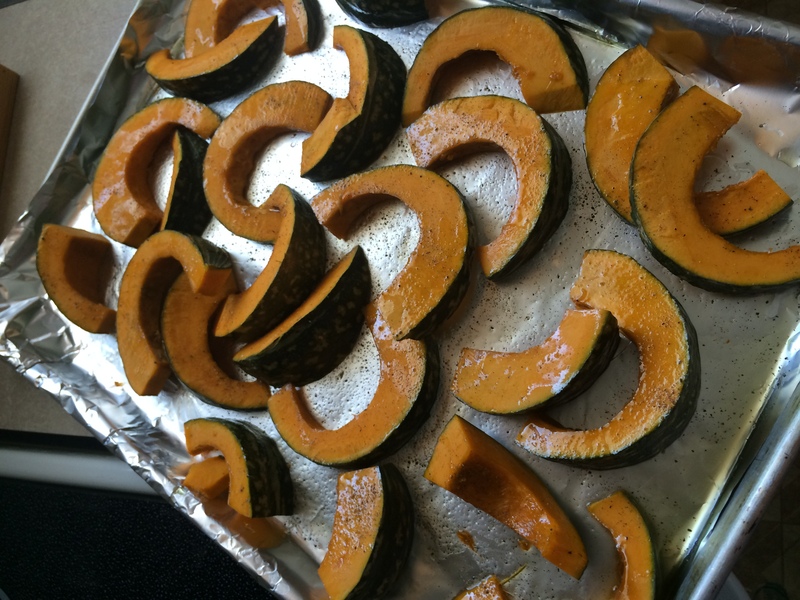 Pop it in the oven for 30 minutes (flipping half way). The MOST important thing, don’t try and eat it right away, it’s a little hot. I know that seems like a no brainer, but for some reason I forget it every time I make anything in the oven. EVER. 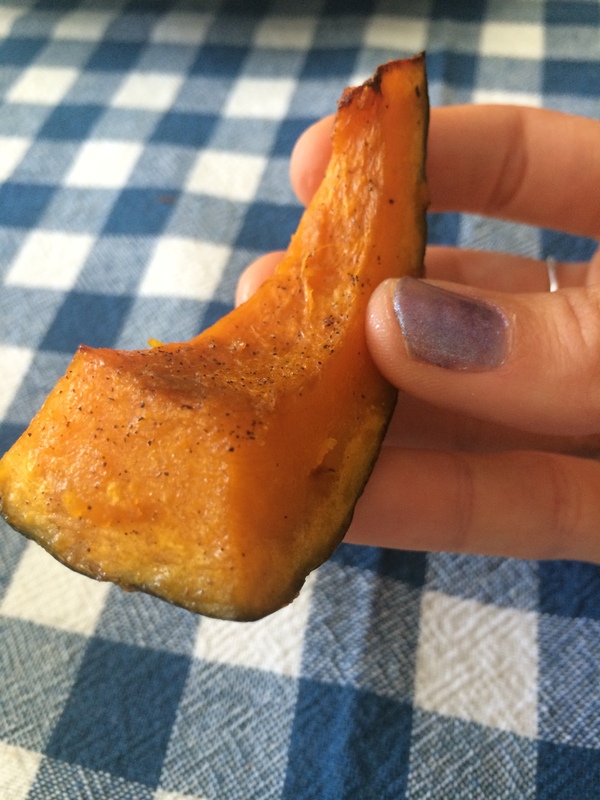 Don’t blame me if you can’t stop yourself and you eat the whole squash.